In July 2015 I scanned and posted forty classic issues of City Cyclist, the Transportation Alternatives bi-monthly 'zine that I curated and edited during my 1986-1992 run as T.A. president. These issues bristle with a hard edge against cars coupled with love and passion for cycling and the cycling community. Go here (this site's "City Cyclist" page) for a listing with links. In April 2016 I scanned and posted The Bicycle Blueprint (pdf), the 160-page master plan-manifesto for New York City that I curated for Transportation Alternatives in 1993. Co-authored with Michele Herman and Jon Orcutt and designed by David Perry, the Blueprint was a summation of the visionary yet practical activism that characterized T.A. during my tenure as president (1986-92), and a beacon for urban cycling advocates everywhere. The high-res version posted here preserves the beautiful graphic layout that was lost in the HTML edition on the T.A. Web site that, until now, was the only digital version available. The Blueprint here is a big file (33 MB) but well worth the download. I blog on cars, bicycles and livable streets for the NYC-based Streetsblog. For a compilation of my 150-odd pieces on that site, go here. Note: Many other pieces with bicycling content, including my two declarations analyzing and condemning NYC's suppression of Critical Mass rides (2004), are collected on the Web page Cars I - Who Owns The Streets?. Perhaps the two most significant pieces here are "The Bicycle Uprising" and my "Bicycling" chapter for the Encyclopedia of Energy. The Bicycle Uprising, my 5-part series posted on Streetsblog in August-September, 2012, recounts the activism that defeated the 1987 NYC Midtown Bike Ban and energized cycling advocacy from the late 1980s to the present. 6,000 words, includes vintage photos, posters and covers from Transportation Alternatives' "City Cyclist" newsletter. I composed Put Bikes Before Cars (pdf) in the late 1990s, aiming to place it in Newsweek magazine's "My Turn" column, where it might convey our (that is, cyclists') feelings about "bikes vs. cars" to a large audience. It wasn't accepted, but almost two decades later, I feel its ideas about culture and jurisprudence remain strikingly relevant. New York City Bicycle Levels, Excel spreadsheet, last updated in March 2013. Model to Estimate Effect of Compulsory Helmet Laws on Cycling Risks, Excel spreadsheet, June 2012. Letter to New Yorker Magazine, Nov. 2006. Komanoff talk, "The Need for More Cyclists", 2005. Komanoff op-ed, "City riding hard on cyclers' freedom", Newsday, 2005. Komanoff op-ed, "Cops should ease up on the bike rides", NY Daily News, 2004. "China's Bicycles Are Us" (unpublished) 2004 op-ed, on the removal of bicycles from China's cities. The Bicycle Blueprint -- A Plan to Bring the Bicycle into the Mainstream in New York City, 1993. Pucher-Komanoff 1999 journal article, "Bicycling Renaissance in North America?" Komanoff op-ed, "Yield to Bicycles", Downtown Express, 2001. Komanoff 1999 essay, "Avenues for Activism: A Talk at the Start of BikeSummer"
Komanoff 1997 essay, Restoring Cycling Habitat, calling for "rights-based" cycling advocacy. This exploratory piece in Bicycle Forum was a precursor to my 2004 Traffic Justice Prospectus. Komanoff post-9/11 meditation, "River Road, Still Here"
Environmental Benefits of Bicycling and Walking, Full text (80 pp) of Komanoff Energy Associates' 1993 "Case Study No. 15" of the National Bicycling and Walking Study, for US DOT's Federal Highway Administration. Komanoff 2001 letter, "Safety in numbers? A new dimension to the bicycle helmet controversy" from Injury Prevention. Transportation Alternatives: 1400 Strong And Growing, 1991 interview with Komanoff and T.A. staff during the final year of his presidency. An invigorating portrait of urban bicycle activism at its most radical, creative and effective. My 1990 New York Times op-ed Bikes Just Lack 'Curb Appeal', written in the run-up to the Gulf War, has taken on an elegaic tone in the wake of the destruction of the twin towers eleven years later. 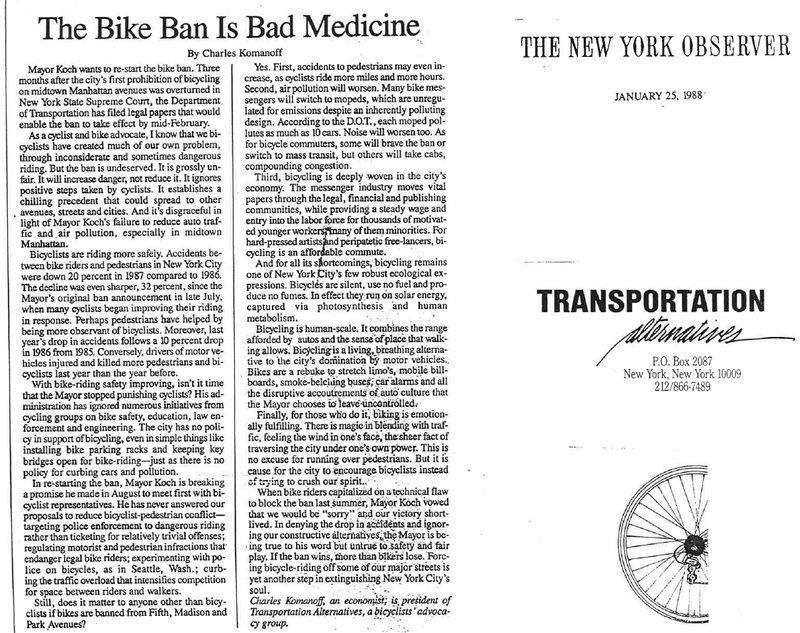 My January 1988 NY Observer op-ed, "The Bike Ban Is Bad Medicine," was an early, earnest and lyrical defense of NYC cycling. View as image (PNG) or download as pdf. My 1978 New York Times op-ed Rights for Urban Bikers, though tame in retrospect, was radical at the time for the sheer fact of championing bicycling in America's largest, densest city.